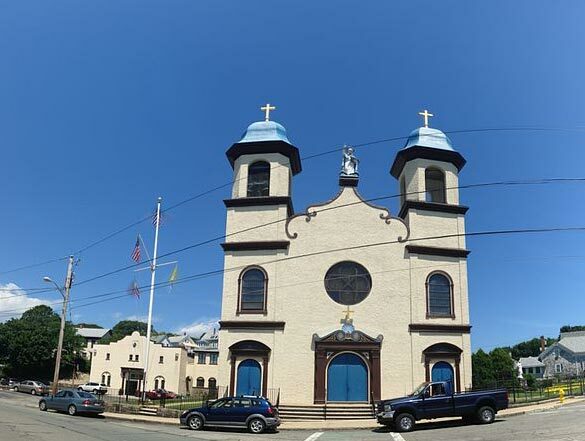 Originally dedicated in 1893, Our Lady of Good Voyage was built for the Portuguese community in Gloucester, after they petitioned the Roman Catholic Church for the establishment of a place to worship dedicated to the Madonna. Large numbers of Portuguese immigrants migrated from the rugged Azores Islands and began settling around Gloucester's Inner Harbor as early as 1829 to work in the city's active fishing industry. By 1888, approximately 200 Portuguese families lived in Gloucester making it the largest Portuguese colony on the East Coast. According to the story of Our Lady of Good Voyage, a stranded fisherman in the rough Atlantic Ocean broke one of his oars and could not return to his homeport. He sought help from the Madonna and the sea miraculously calmed allowing him to reach port safely. A fire destroyed the original church in 1914. Prominent architect Halfdan M. Hanson designed and immediately began building the existing, unique Mission style church, which replaced the earlier church. It is the only Mission style church in Gloucester. Modeled after a church in the Azores, Our Lady of Good Voyage consists of two distinct sections: the two-story main worship space that is of a cruciform plan and an L-shaped rectory that extends from the northwest corner of the main worship space. The rectory, which was built between 1872 and 1884 as a separate building, was incorporated into the new church. Resting on a granite foundation, the building is covered in a buff-colored stucco. Flanked by two identical bell towers, the central bay of the façade is pierced by the main entrance at the first level. A rose window adorns the second level, above which rises an ogee pediment supporting a pedestal and a statue of Our Lady of Good Voyage, who holds a boat in her left hand as a symbol of a safe voyage. In 1922, bells were installed in the towers. These bells, still in place today, were cast by John Taylor & Company of England-the same foundry that cast Phildelphia's Liberty Bell. Our Lady of Good Voyage is located at 142 Prospect St. in Gloucester and is an active church. For further information, call Our Lady of Good Voyage Parish at 978-283-1490.